Each 5 week session costs $100. Session fees are due upon registration to secure your spot in class. Due to limited class size, late cancel fees apply. 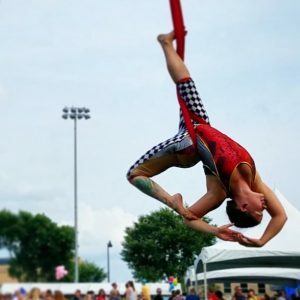 If you have at least 6 months of aerial experience and are looking to explore aerial sling as an apparatus, Aerial Sling 1 (Beginner Aerial Sling) may be the class for you! Sling is a unique apparatus that can be used like a silk or a trapeze in many ways, but that has its own special vocabulary and characteristics. We’ll learn lots of vocabulary and transitions and work on building longer sequences in this class. In addition to 6 months of aerial experience, it’s recommended that students have a strong invert and can execute an unassisted pullover.